Shortstop J.P. Crawford remains a consensus top 10 prospect in baseball entering the 2017 season. Crawford, who turned 22 earlier this month, will be in his second big league camp in Clearwater with the Phillies in two weeks. If you rebuild it, the ‘reward’ that is a publication’s annual prospect ranking will come. In the last week, both MLB.com and ESPN.com released their annual preseason rankings of the top 100 prospects in baseball. ESPN prospect insider Keith Law unveiled his list late last week while MLB Network broadcast their own list, via MLBPipeline.com, on Saturday night. As you may or may not remember, the rebuilding Phillies fared well on these lists last year: they had an MLB-best seven players on MLBPipeline.com's Top 100 this time a year ago and had five players on Law’s ESPN list. Four of those seven players arrived via trades: Jorge Alfaro, Nick Williams, and Jake Thompson (Cole Hamels trade) and Mark Appel (Ken Giles trade); the three others were former first- or second-round picks, J.P. Crawford, Cornelius Randolph, and Roman Quinn. Not surprisingly, the two teams that ended up with the most players on this year’s MLBPipeline.com Top 100 are also organizations that did a bit of their own rebuilding in the last 12 months (with a good chunk of inventory acquired in trades). The Atlanta Braves and New York Yankees (an MLB-best seven each) accounted for 14 of the 100 players on MLB.com's list. The Phillies had just three players on both lists: Crawford, Mickey Moniak, Alfaro. The five players who made last year’s MLB list but missed this year fell off for a variety of reasons, including graduation to the big leagues (Thompson, Quinn), progress as prospects delayed by time-consuming injuries (Randolph, Appel), and, to put it bluntly, bad seasons (Williams). But the dropoff here shouldn’t be viewed as a bad trend for the still-rebuilding Phillies. For one, these lists are subjective and are no guarantee of future major league success; and it was just less than three months ago that the Phils were honored as having the best farm system in baseball during the 2016 season by MiLB.com. 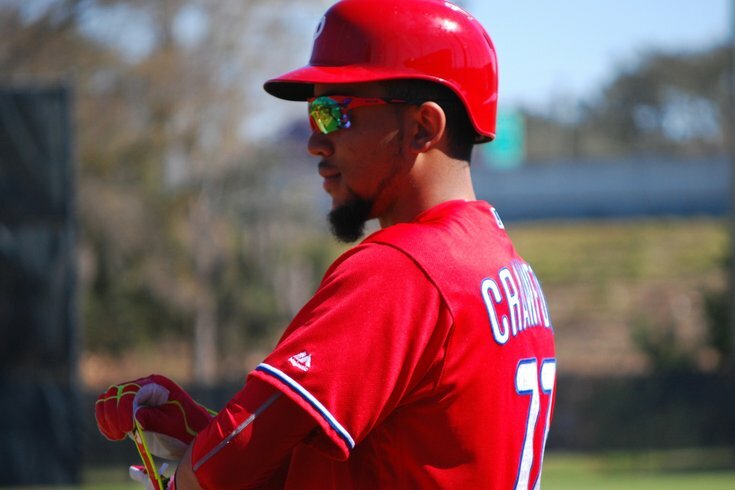 • J.P. Crawford, who turned 22 earlier this month, remains a consensus top 10 prospect in baseball (No.5 by ESPN, No.7 my MLB.com). The slick-fielding shortstop struggled to get his bat going at Triple-A after an early-season promotion (he slashed .207/.308/.261 after July 31). But Phillies' evaluators (and obviously the folks that put together these lists) are still very high on Crawford, who should arrive in Philadelphia before July if his bat (as expected) adjusts in his first spring in Triple-A. Crawford will be in his second major league camp in Clearwater, Fla., in two weeks when spring training gets underway. • Mickey Moniak, who doesn’t turn 19 until May, impressed during his first pro summer after being drafted with the first overall pick in the 2016 draft and is ranked in the top 30 on both lists (No.30 by ESPN, No. 19 by MLB.com). For no other reason than writing about a bunch of these guys leading up to the draft, here is where some other notable names drafted last June are ranked: Kyle Lewis, (11th overall pick), 29th in MLB, 68th in ESPN; A.J. Puk ,(6th pick), 69th in MLB, 93rd by ESPN; Jason Groome, (12th pick), 41st by MLB, 20th by ESPN; Nick Senzel (second pick), 26th by MLB, 15th by ESPN, Blake Rutherford (18th pick), 37th by MLB, 22nd by ESPN. • Nick Williams is arguably in need of a bounce-back season more than any else in the Phillies farm system after being ranked in the Top 100 by MLB.com (64th), ESPN (74th), and Baseball America (27th) last winter and already falling off two of those three this winter. (Baseball America’s 2017 list should come out within the next couple of weeks). Williams, 23, hit .258 with a .287 OBP at Triple-A in his first full season in the Phillies organization with more than 100 more strikeouts (136) than walks (19) in 527 plate appearances. Williams struck out 54 times and walked just once in 46 games after the All-Star break. Dylan Cozens and Rhys Hoskins, didn't make either of the latest 2017 lists (although Law wrote he would have included them if his rankings ran to 150), apparently have to go out in 2017 and prove their powerful 2016 seasons weren't one-year wonders. • Again, Baseball America, which has been doing these rankings longer than anyone, has yet to publish their Top 100 heading into 2017. Look for that before camps open in Florida and Arizona in the next few weeks. Baseball America did publish their list of the Top 10 prospects in the Phillies organization last month. You can see ESPN's latest Phillies' list within their updated prospect index (although, as with most of their prospect content, you need to be an ESPN insider). *apparently MLBPipeline.com did not update their individual team rankings when they did their MLB-wide Top 100. Weird.